All cultures around the world have embraced the drum at some point in their history for healing, meditation, sacred ritual and for connecting with the Divine. Frame drums are some of the oldest musical instruments, and there is evidence of ritual shamanic use as early as the Paleolithic Era. 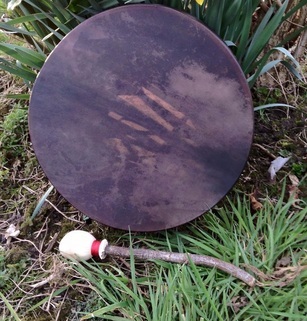 A revered and sacred tool of priestesses and holy men, indigenous shamans, nomadic and tribal communities, the use of the drum today for its ceremonial, spiritual, healing and therapeutic benefits has not changed a great deal since the time of the earliest civilisations. Reiki is a system of natural healing which has also been in use for many thousands of years. Rei-Ki means spiritual energy or universal life-force energy. At an atomic level everything which exists in the Universe is made up of energy vibrating at different rates. Humans are also comprised of electromagnetic energy and in healing Reiki acts holistically, affecting all the energies comprising the human body, physically, emotionally, mentally and spiritually. Reiki is non invasive and has been shown to effectively stimulate the relaxation response.